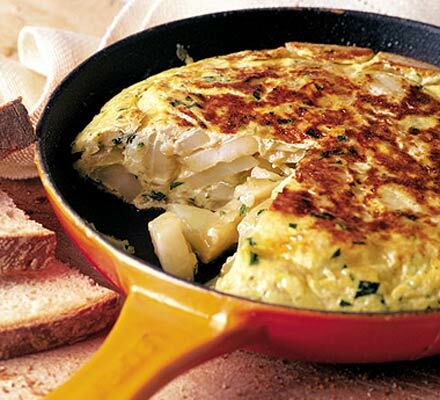 Is there was any trick to making this, the most classic of Spanish tapas, the true Spanish Omelet(Tortilla Espanola), filled with potatoes and onions, served in wedges or squares in Spanish bars. The answer is yes: You need to use plenty of fruity olive oil (Goya’s Extra Virgin, available in most supermarkets, will give you an authentic Spanish flavor, as will any high-quality Spanish extra-virgin olive oil), and to cook the potatoes and onions thoroughly before adding them to the eggs. And these days, I like to cook eggs, as well as potatoes, in a non-stick skillet. The one bit of crucial advice I failed to give was that I have found it impossible to cook the potatoes and onions as they should be in the same small pan that it takes to cook a properly thick, moist omelet. For the potatoes and onions, use a pan large enough to spread them out, at least 8 inches, but 10 is better. For the following amount of ingredients, and nice, thick omelet, use a pan no larger than 7 inches. In an 8- to 10-inch skillet, heat the oil over medium heat. Add the potatoes and onions and immediately reduce heat to low. Sprinkle with salt and mix well. Saute the potatoes and onions slowly, shaking the pan frequently to prevent sticking, and tossing the mixture occasionally, until onions are golden and almost a puree and the potatoes are very tender. Neither vegetable should brown. Meanwhile, in a mixing bowl, beat the eggs well. When vegetables are done, remove from heat. Let the vegetables cool a few minutes. With a slotted spoon, remove the vegetables, leaving behind as much of the oil as possible. Place vegetables in bowl with eggs and mix well, seasoning with salt and pepper. 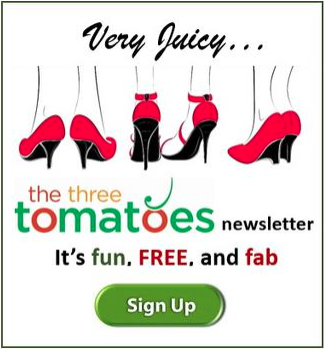 Drain the fat from the large skillet into a smaller skillet (5 to 7 inches). Heat oil over medium heat, pour in the egg mixture, and immediately reduce heat to low. Cook omelet until all but the top of the omelet is set and the bottom is only very lightly browned, 5 to 8 minutes. Slide the omelet, uncooked side still up, onto a plate. Turn the skillet over the omelet on the plate. Then, flip the omelet and skillet over so the eggs are now uncooked side down in the skillet. Return skillet to low heat and continue to cook another couple of minutes, or so or until the second side is set. It should not be browned at all. Flip the omelet onto a serving plate, second side up. Cool to room temperature before slicing and serving. Cut into wedges or cubes. Note: Although the omelet is most usually served at room temperature, the fresher it is, the better. It should not be made more than several hours before serving.